Fort Crailo (1663-1783) - A 1642 Dutch settler's brick manor house fortified and used as a fortification during King Philip's War, the French & Indian War and the Revolutionary War. Located in present day Rensselaer, Rensselaer County, New York. Named Fort Crailo after the original house name. Probably abandoned as a fortification by 1783. Fort Crailo was originally the home of the Hendrick Van Rensselaer family. The 1642 Dutch settler's brick manor house named was named "Crailo" after the family home in Holland. The house was configured by 1663 as a small fortification to protect local settlers from hostile Indians. In 1675 during King Philip's War the local militia constructed a palisade around this fort. After a attack during the French & Indian War in May 1746, the building was fortified with loopholes, eleven gunports and surrounded with a stockade. The home and grounds were used to quarter colonial troops and the home entertained British and colonial officers during the French & Indian Wars. During the Revolutionary War Patriot troops were camped on the grounds in 1775 and 1776. 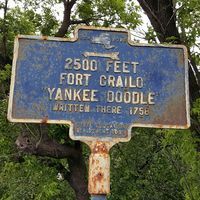 The song Yankee Doodle Dandy was said to be penned here in 1758 by Dr. Richard Shuckburg, a British Army surgeon who was amused by the provincial militia drilling for an upcoming attack against the French at Fort Ticonderoga. Probably abandoned as a fortification by the end of the Revolutionary War in 1783. Now a part of Crailo State Historic Site in Rensselaer, Rensselaer County, New York. Small marker located along Columbia Street. Location: Crailo State Historic Site, 9 Riverside Ave, Rensselaer, Rensselaer County, New York. Roberts, Robert B., Encyclopedia of Historic Forts: The Military, Pioneer, and Trading Posts of the United States, Macmillan, New York, 1988, 10th printing, ISBN 0-02-926880-X, page 545. This page was last modified 21:09, 7 January 2019 by John Stanton.